A simply delicious and frugal dinner! So versatile, you can use virtually any of your favorite veggies, such as those listed below, or other favorites like butternut squash, cauliflower, parsnips, etc. Just be sure to cut the veggies accordingly, so they’ll cook evenly alongside the chicken. 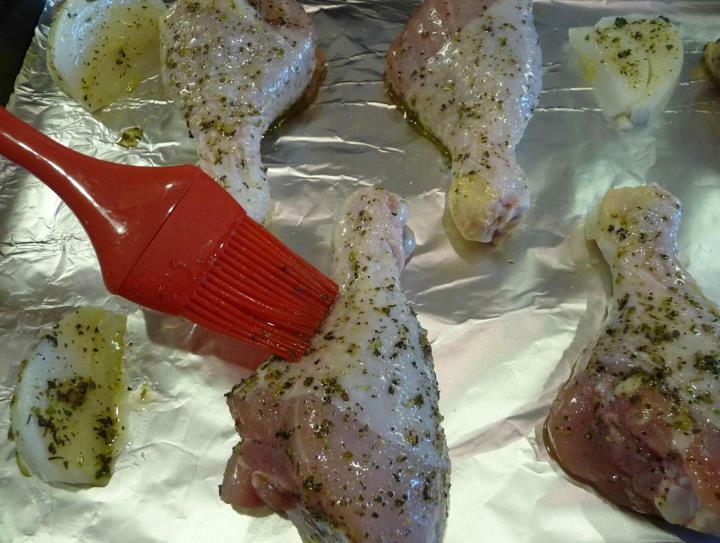 Lightly brush both sides of the drumsticks with the herb-oil mixture. Then, lightly sprinkle with additional sea salt. 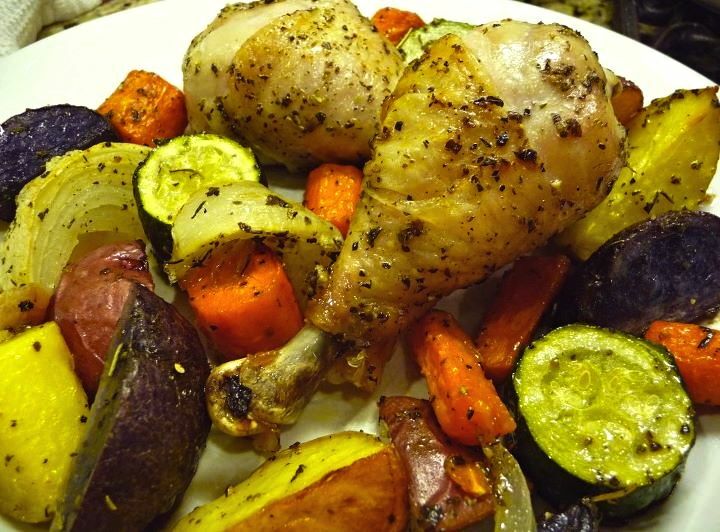 Arrange veggies on baking sheet alongside the chicken and onion wedges and roast until chicken is cooked through. Preheat oven to 425 degrees. In a large bowl, combine 2 tablespoons of olive oil with the Italian seasoning, salt, pepper and minced garlic. Place drumsticks and onion wedges on a foil-lined, large-rimmed baking sheet (12x17) and lightly brush both sides with the herb-oil mixture. Then, lightly sprinkle chicken with additional sea salt. Next, add one additional tablespoon of olive oil to the remaining herb-oil mixture. Add the veggies and garlic halves to the bowl and toss well to coat. 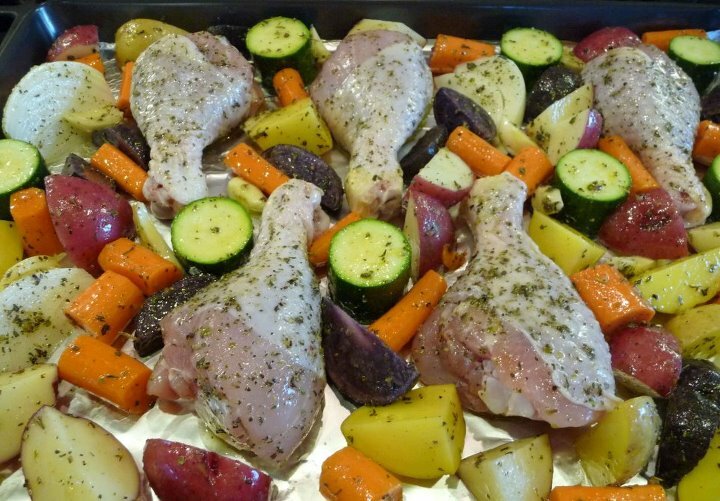 Arrange veggies on baking sheet alongside the chicken and onion wedges, as shown in photo below. Roast 40-45 minutes, until chicken is cooked through and vegetables are tender. Serve with a big salad and buttermilk biscuits with butter! Mmm! Made this tonight and it was delicious! Subbed coconut oil (ran out of EVOO) and used Freah Market poultry seasoning! I thank you for this herb-oil mixture. I’ve used it on chicken thighs with great results. Tonight, I’ll be preparing fresh flounder using the mixture…..should be very savory. This has become a staple in our home. I’ve made it about 4 times over the past six months and the last time was for company. We love this. Thank you. We made this meal tonight and not a single person in the family complained – they all raved! Meals that win over everyone don’t happen nearly enough with 6 people, so I really appreciate it. Thanks! We loved this! It was easy, economical, and still felt “special.” Even my super-picky 5-year-old gobbled it up. Thanks for another winning recipe for my family! 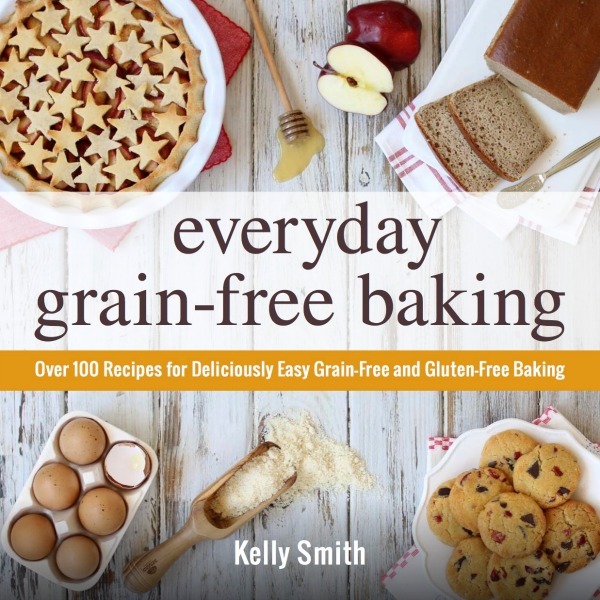 Wow thank you Mrs. Kelly I would definitely be looking more at your recipes. It was delicious! And thanks for your response. At what temp should I roast the chicken legs and veggies?